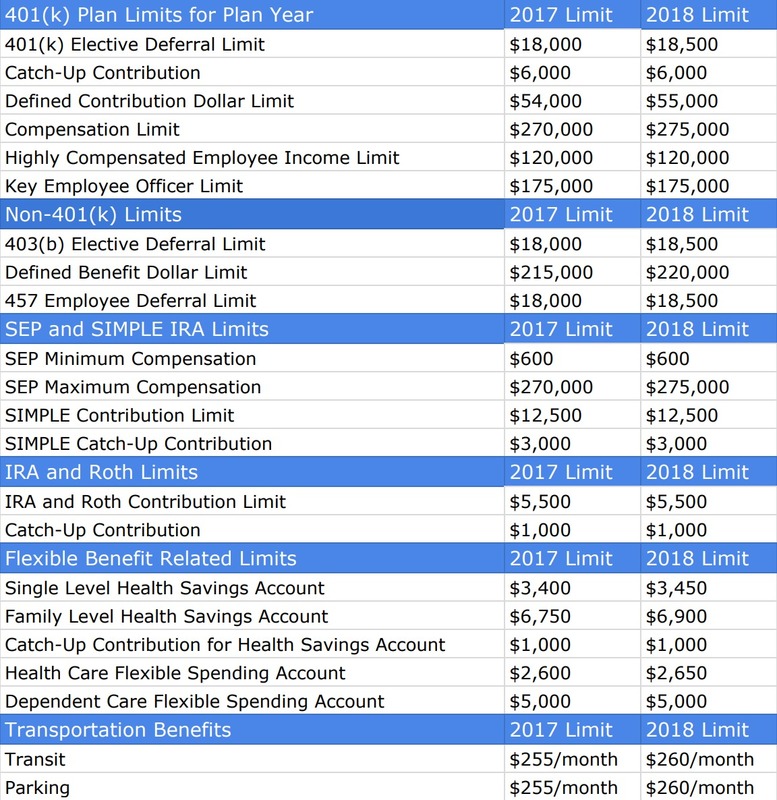 There are limits to how much employers and employees can contribute to a retirement plan, IRA, or flexible spending account each year, and the limits differ widely, depending on the type of plan. After three years at a standstill, the Treasury Department recently raised the limits for contributions to pensions and other retirement plans such as 401(k)s, 403(b)s, 457(b)s, and other similar plans. They also increased contribution limits for a number of flexible benefits. This is great news for employees who take advantage of pre-tax contributions to save money for retirement and on their health care and commuter spending. The overall limit for a 415(c) plan has jumped to $55,000, up from $54,000. Defined Benefit Plan Benefit Limits for Annual Benefits were increased from $215,000 to $220,000. For SEP IRAs or solo 401(k)s, the amount you can contribute as an employer, as a percentage of your salary goes up from $54,000 to $55,000. The Annual Compensation Limit also increases, from $270,000 in 2017 to $275,000 in 2018. The Health Savings Account limits have been raised from $3,400 to $3,450 for Single Level Medical Coverage and from $6,750 to $6,900 for Family Level Medical Coverage. The yearly limit on employee contributions to their employer-sponsored healthcare flexible spending account (FSA) has increased from $2,600 to $2,650. The monthly limitations for commuter benefits was raised to $260 a month from $255 a month for both transit and parking. Employers should work with their HR and Payroll Team to adjust their contribution settings for the new year and to inform employees about the new limits in their open enrollment materials.